This story was updated at 12:35 a.m. EDT. Three astronauts soared into space aboard a Russian rocket ona mission to the International Space Station during the early hours of GoodFriday. 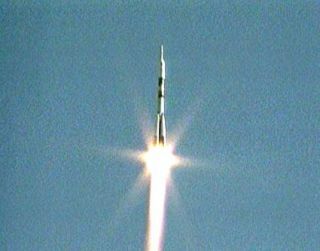 The spaceflyers blasted off at 12:04 a.m. EDT (0404 GMT) on the Soyuz TMA-18 spacecraftfrom Kazakhstan's Baikonur Cosmodrome. The launch took place amid heightenedsecurity in response to a spate of recent terrorist bombings in Russia. Russian cosmonaut Alexander Skvortsov commanded the flight,which will bring him and fellow cosmonaut Mikhail Kornienko, along with NASAastronaut Tracy Caldwell Dyson, to the space station to begin long-term stintsas Expedition23 flight engineers. "Feeling fine," Skvortsov radioedshortly after launch. "The systems are nominal and the vehicle is performing well." The three are expected to arrive at the orbiting labon April 4, Easter Sunday. "For us it will be a big holiday, and we are proud thatwe are launching on Good Friday and docking on Easter," Skvortsov saidbefore the flight. Skvortsov and Kornienko are making their first spaceflights,while Dyson is a veteran NASA shuttle astronaut on her first long-duration trekto the space station. "As a cosmonaut, as a person who?s dreamed of flying inspace for a long time, naturally I am eagerly looking forward and awaiting thismoment when I will find myself in space, and also I think that this will be oneof the greatest goals that I can ever achieve in my life," Skvortsov said. The three spaceflyers will join current Expedition 23commander Oleg Kotov of Russia, as well as Japanese astronaut Soichi Noguchiand NASA astronaut Timothy (T.J.) Creamer. Together they will bring the crewtotal on the station to its maximum of six long-duration residents representingthree countries. "As to the International Space Station, it?s apriceless experiment in international cooperation," Kornienko said. "We are learning to work together, and in my opinion the next step isinterplanetary exploration of space, the moon or Mars." The astronauts plan to spend much of their time doingstation upkeep duties and participating in scientific research. They will hosta number of visiting spacecraft, including the spaceshuttle Discovery, which is set to launch with seven astronauts on April 5,only three days after the Soyuz launch. Later on the station crew plans to receive the first-evervisits of the privately built Dragonunmanned cargo delivery spacecraft, built by SpaceX. "I think the good news is that we get more peopleinvolved, and people want to live in space, people want to experience space,and I think this helps open the door to make that happen, to be involved inwhat we?re doing with the space station," Dyson said of this milestone forcommercial spaceflight. Their mission will also feature a number of spacewalks, bothamong the American and Russian long-term crew, and by visiting astronautsaboard space shuttle missions planned for the coming months. Dyson willparticipate in one spacewalk, the first of her career, to install a new fixtureon the outside of the station that will provide a base for robotic arms to grabhold of. "To be outside and experience that with nothing morethan my visor between me and the structure, and then there?s the whole topic ofthe Earth going by," she said. "I don?t know if that?s going to bebreathtaking or tripping me out, but I am really looking forward to seeing thatand experiencing that."